My experience with Target Price is similar: I’ve heard many opinions in favour and against it and probably in general it’s not “right” or “wrong", but it's a strategy that, depending on the context, can be more or less appropriate. Basically, the idea is to share with the subcontractors the price level that they are supposed to reach – or if you want to see it the other way around how much you can afford to pay to build the wind farm. BoP is (partially) a custom service with certain technical specifications that in some cases can be changed. The implication is that the input of the subcontractor can be requested to hit the target, or some initial requirements can be changed. A classic example is the level of redundancy of the substation: fail proof solutions are not cheap. Material costs can be clearly identified (in some cases). This is for instance the case when items like medium voltage cables are purchased - a key driver in the cost of cables is the spot price of the raw materials (copper, steel, aluminium) so it’s relatively easy to calculate how much you should pay. 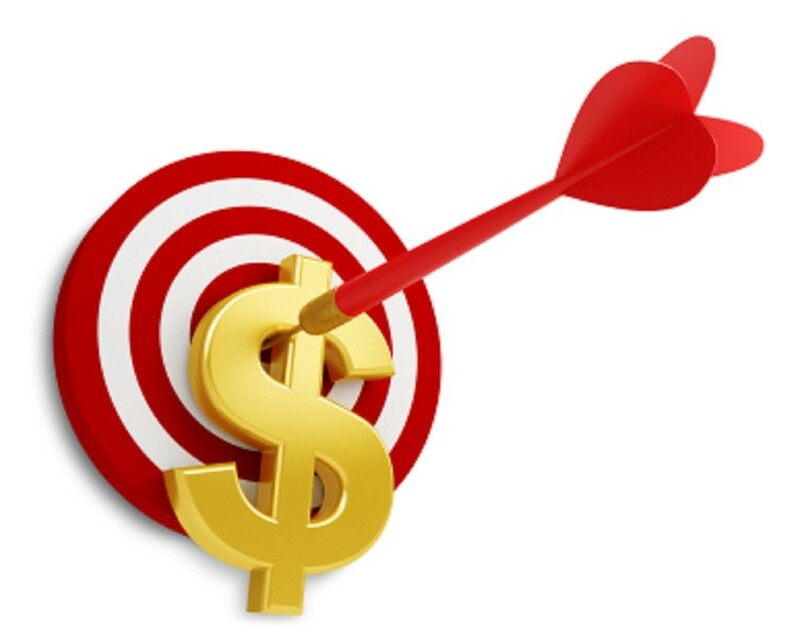 To give a target price, the buyer should understands the cost structure. This is not so easy as sit might seem: people dealing with BoP are usually operating in different markets, interacting with companies of different sizes and with different business models. Therefore having a clear view of the seller costs structure can be a daunting task. Price volatility should be low. This is true in certain markets where it’s easy to find a steady supply of bidders. However, overheated markets with several competing projects executed at the same time can create price volatility: basically, the resources that you need to build the wind farm (for instance the crane, or the mobile batching plant) will go to another project – another wind farm nearby, or possibly something totally different. One interesting fact that you might not know is that the Big G (that is, Google) decided several years ago to power 100% of its activities using renewable energy. They reached their objective in 2017: what is surprising is that they started only in 2010, with a wind farm in the USA. Basically the strategy is to close Power Purchase Agreements with developers, aiming at investing in “additional” production. “Additional” means that they don’t want only to buy renewable energy: they want to add this MW to the grid, building new plants and lowering the carbon footprint. Another interesting fact is that they buy renewable plants connected to the same grid were the data centres are. For instance their very first PPA was for a 114 MW windfarm in Iowa, one of the states with a data centre, while their 72 MW wind project in Sweden (2013) was intended to “feed” the data centre in Finland. The next step is to sell power to the grid at the spot price. Here is where the magic happen: Google is willing to sell it at a loss in case the spot price is lower than the price indicated in the PPA. The idea is that they wanted to use their financial power to give developers a steady cash flow, assuming the risk of fluctuations in prices. They also get the famous “renewable energy credits”, and they use them to offset the carbon footprints of the data centres. A legitimate question would be “Why don’t you buy directly the renewable energy credits?”. 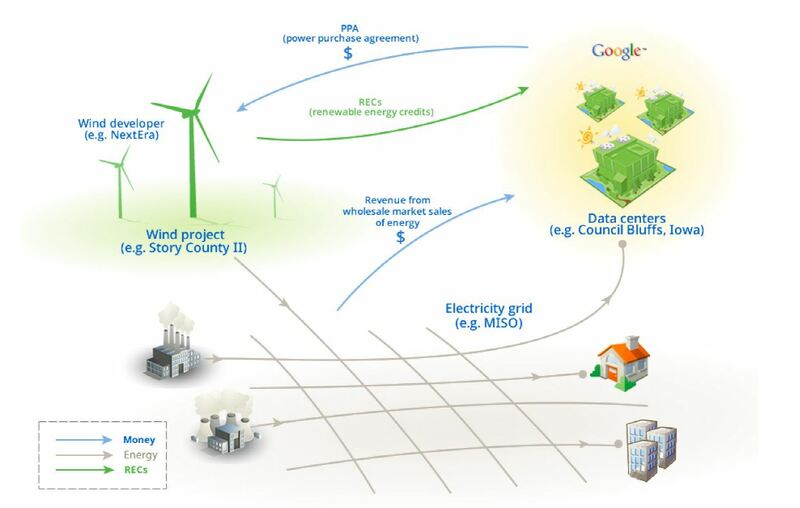 The position of Google, as mentioned before, is that they want to help developers to create more and more renewable energy plants. They believe that the best way to do it is to use their deep pockets to make more projects reality - "bankability", the possibility to get the money to finance a project from a panel of bank, is usually one of the critical point that kills many developments. The good news, at least for people like me in the wind business, is that the vast majority of the investments (>95%) are in wind farms. The same apply to other business giants following Google on the renewable path, such as Amazon, Microsoft and Facebook. Mergers and acquisition are not a recent phenomenon in the wind business. My former manager Luis Miguel still remember vividly the merger in ’97 between Nordtank Energy Group (NEG) and Moerup Industrial Windmill Construction Company (Micon) – and the subsequent merger between NEG Micon and Vestas in 2004. While in ’97 I was still enjoying the Golden Age of University, I had myself the pleasure of experiencing first-hand the merger between Nordex and Acciona Windpower 2 years ago. The same year Siemens merged with Gamesa, creating a new giant in the business. And that was not all, because GE’s completed the acquisition of Alstom. Well, if you want my two cents on the topic the trend is going to continue in the next years. 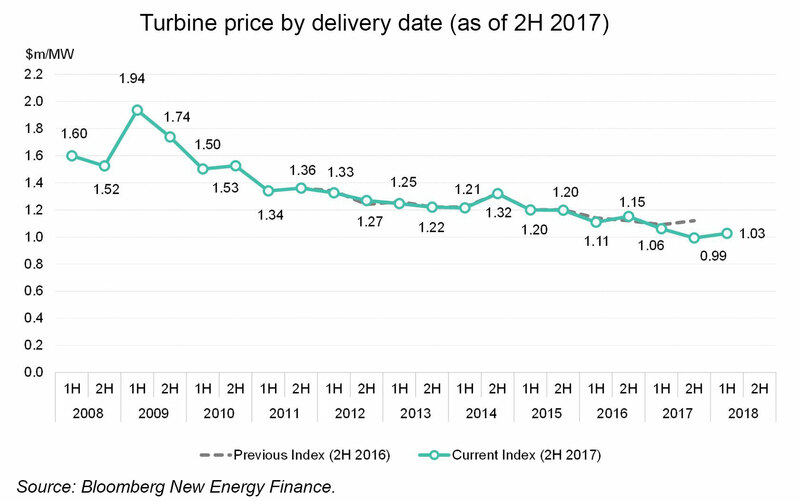 Wind turbine prices are free falling, and quite a lot of MW are awarded with an auction system were the cheaper takes all. Every wind turbine manufacturer is working hard to lower the cost of energy, and for sure economies of scales help in the effort. I would say that Senvion is a good candidate for the next M&A: owned by the private-equity firms Centerbridge and Rapid Partners could be a good target for a Chinese manufacturer, for instance. The acquisition can also be “vertical” in the value chain – turbine manufacturers are purchasing companies producing blades, blade moulds (Nordex with SSP Technology), or even providing Service (Vestas with the Operation and Maintenance company UpWind Solutions). I see a consensus in the industry that this consolidation process will continue during the next years, somehow similar to the automotive industry. 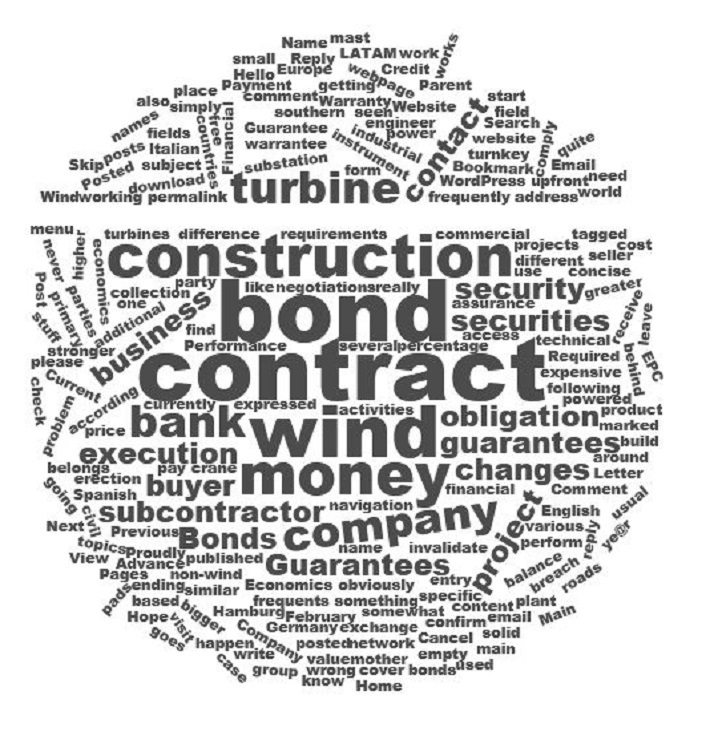 The development of a wind farm project is characterized by several milestones linked to contractual obligations of the parties. 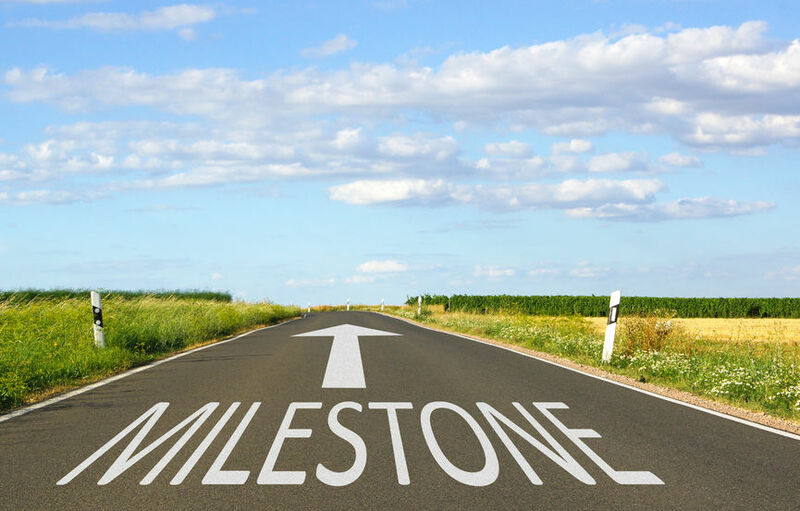 The most relevant milestones are marked below. They are in chronological order, and some of them could not appear in a specific project (for instance, not all projects have a limited notice to proceed or the payment milestones can vary a lot from project to project). Limited notice to proceed (LNTP): in this milestone an agreement is reached between the party to perform some works (for instance, to purchase some long lead time item, such as the substation main transformer). It makes sense when it’s necessary to accelerate the project for some reason. Commencement date: in this milestones, all condition precedents are met and the contract is activated. Commission certificate: at the end of commissioning (a set of test done to confirm that the turbine is ready for production) the turbine is ready to start trial operations. A certificate is issued to formalize this fact. Taking over certificate (TOC): this milestone is usually linked to transfer of risk and beginning defects liability period for a specific turbine (the “defects notification period”). Provisional acceptance: from this point in time, usually an Operation and Maintenance contract for the wind farm start. Final acceptance: in this milestone the customer formally accept that the wind farm is complete, fully operational and compliant with the relevant technical specifications. Wind derivatives: is hedging the risk the next step for wind energy? Weather derivatives are not a new product. The first contract were traded over the counter in the ‘90s, with the Chicago Mercantile Exchange (CME) introducing from 1999 a broad set of products like futures and options that are widely traded today. They are a financial product that can help hedging the risk associated with the inherent variability of weather. They are not like an insurance. With an insurance, you know that one or more events (for instance, a hurricane damaging your wind farm) will trigger a payment if certain contractual conditions are met. 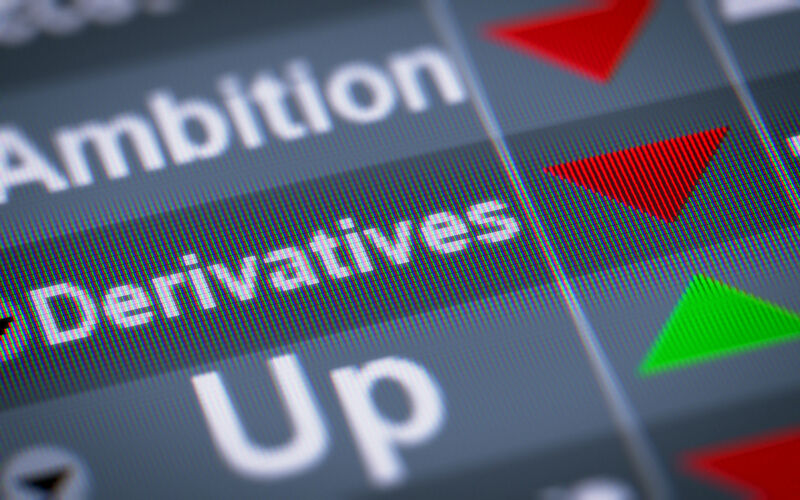 Derivatives are more “continuatives”. Simplifying a lot, you can get money if a certain index is above (or below) a certain threshold in a given time frame. For instance, a common contract traded in the CME is linked to the (cumulated) difference between the actual temperature and 18⁰C. Basically, if the weather is warmer than usual you will have a payoff: this will lower the business risk of companies whose activity is linked to cold weather (for instance, selling products to household heating). In the previous example the index underlying the derivative is the temperature. In the case of wind energy, derivatives can be built around 2 different concept – wind speed (as measured at the met mast or in a meteorological station) or wind power (that is, hedging the actual production of the wind farm). A second categorization would be the typology of contract built around the chosen index. At least theoretically, all the standard structures are possible – e.g. futures, options, floors and other types of cash settlements. I’m writing this post because I’ve noticed that, in countries where the wind energy has a high penetrations, wind derivatives are not a mental experiment – they are already a reality: for instance in Spain there is a specific market for them, and this second product cover the highly developed German market. My first impression is that wind conditions are very local – therefore it can be hard to find an off the shelf financial product considering a wind index that match the conditions of the area where the wind farm is operation. Possibly these products are more useful for an utility (trying to hedge the risk on a nationwide level) than for a small energy producer. In the first half of 2017 cryptocurrencies (like Bitcoin, Ether, etc.) experimented an incredible growth – considered a bubble by some and as a proof that times are changing by others. What is interesting (at least to someone working in the renewables like me) is this link between cryptocurrencies and renewables. Cryptocurrencies are created with a process called “mining”. In a nutshell, computational power is used to maintain the network of computer with the ledger of transactions. Computers, electricity and time to set up the network aren’t free. Therefore the “miners” are rewarded with new cryptocoins that can be converted in other currencies, products or goods. 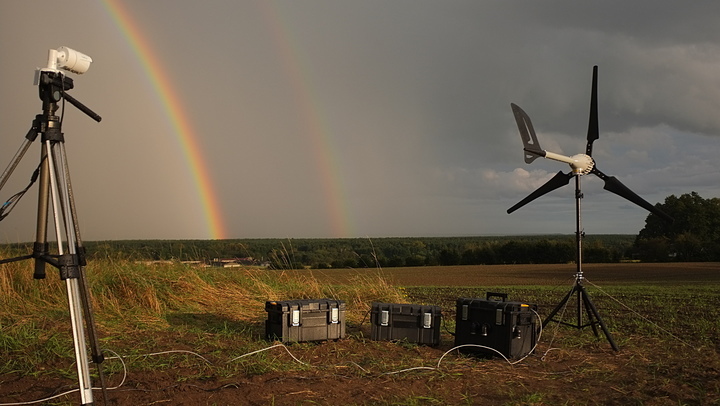 An artist from Berlin, Julian Oliver, created an installation - a good example of conceptual art - to convert wind energy into electricity to mine cryptocurrencies (PDF here if the link doesn’t work). Appropriately, the name of the installation is “Harvest”. I have seen several calculations of the energy necessary on a worldwide scale to run Bitcoin and other similar networks. It’s difficult to cross check the numbers but they look quite impressive. In one of this calculation the total power used is more than the energy needed by small countries like Cyprus. On the short term I don’t foresee people purchasing multi megawatt WTGs to create cryptocurrencies. However, given the amount of power involved in computing, the idea to power datacenter with renewable sources of energies doesn’t look so unrealistic to me in several years from now.